How Far Along: 20 weeks today, December 9th! With a scheduled repeat C-section taking place at 39 weeks, we're officially more than halfway to meeting M3. Equal parts exciting and overwhelming. Symptoms: Heartburn has been tolerable with my trusty TUMS although I know it's only going to get worse over the course of the next couple of months. Hip pain is horrible- after spending so much time on my feet this past weekend, I definitely felt it and spent most of Sunday with my feet up. Definitely walking like I'm pregnant now. Maternity Clothes: Officially grown out of all of my "first trimester" clothes. Size small tops from the GAP are too tight and my size small pants and leggings are getting a bit snug, too. Santa is bringing me a few new basic long sleeve tops for Christmas and I'm excited to spend the rest of my pregnancy in leggings and tunics. Movement: Mr. AP felt M3 for the first time early last week while we were sitting on the couch watching a movie. With this being our last baby, I'll never forget how excited he gets when he's able to feel him wiggling around in there. It's such a sweet moment! Sleep: What's that? Pregnancy insomnia is in full swing and every morning I'm awake like clockwork at 3am. Most mornings I have difficulty falling back asleep and will just lay in bed mindlessly playing on my phone until the boys are up for good at 7am. Thinking Names: Mr. AP jokingly refuses to talk any more about names until 2014. He prefers to stick with tradition which means we don't really discuss names until the third trimester. It drives me out of my ever-loving mind! Funny Moments: Whenever I ask Carter about the baby in my belly he momentarily freaks out thinking that I actually ate a baby. It's both funny and horrifying at the same time. Not So Funny Moments: Feeling winded after walking up the mall stairs and realizing that January will be here before we know and that means we'll have a new baby here in three months. Holy crap. Nesting: Starting to think about the boys bunking together and what we'll do with Maclane and the crib situation. Not really thinking about it too much because it's stressing me out. Best Moments this week: Feeling M3 on the regular, throwing one heck of a Cookies & Cocktails party and our first snowfall! What a way to end 2013. Looking Forward To: Our anatomy scan tomorrow! We had our anatomy scan on Friday (another little girl by the way! :)) and it really is so incredible. I thought since we knew it was a girl already that we wouldn't be as excited. I was so wrong. It's amazing. Love following your updates and it reminds me I need to do one soon myself! Now off to check out those leggings. I need more than 1 pair! Love these pictures! Stunning! And the name game is always the most annoying part....especially for me because I like to decide like as soon as the test is positive and my husband is the "wait until the third trimester" type. BTW, I was due on your due date this year and delivered April 3rd! Brought back a rush of emotions when I read your due date! What a beautiful photo with the snow! And you look great. 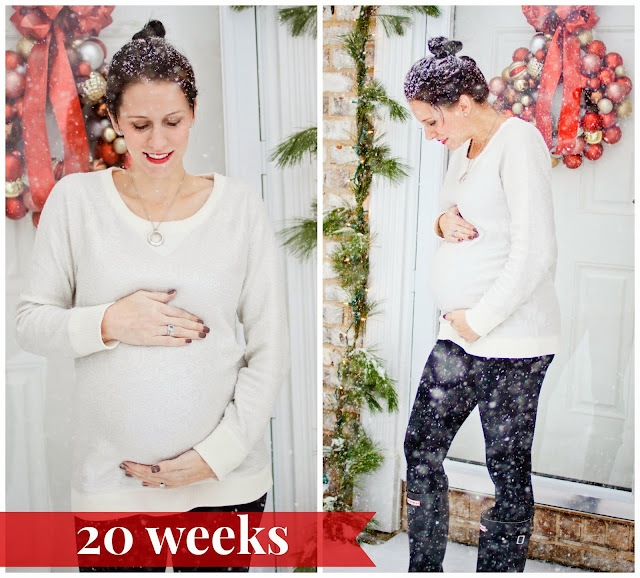 I just love this snowy bump date picture! Looking good mama! Can't believe you're at the halfway point already!! Crazy! Congrats, I'm pregnant with #3 and am 20 weeks along too. Must be something in the water, lots of preggo people out there. Cute pics. I'm 22 weeks today and also crave spicy but have crazy heartburn, especially at night! No fun. I'm 22 weeks pregnant today and I also crave spicy foods but have crazy heartburn. No fun! I love these updates. I'm due in January and am jealous of how cute you look even when freezing in the snow! Annnd nearly spit out my coffee when you mentioned Carter thinking you ATE the baby. Kids, man! Love these pictures!!! So, my hip pain is horrendous! I'm going to be asking around about a hip brace today. Tums yes. The name game must start now! I know Mac is younger than Chase and I'm giving you my 2 cents even though you didn't ask. If he isn't climbing out of his crib I would leave him. Most people tell me to move C and I tell them hell no. I will be up all night with 2 babies why do I want to f with the toddler? The plan is to just get us all through the first few months of omg we have 3 kids and then figure it out. i am so blind i thought your 20 was a 30 from the thumbnail and almost pissed myself. Love the snow pictures! You look fabulous! I am eager to hear the name. Will you tell us when you decide? You're so beautiful! Love the pics and love the update! Love these pictures and the update! You look beautiful! You look absolutely wonderful! amazing what a touch of red lipstick will do to doll up an IHA bun ;) radiant! !